Posted 3/30/13 – The Sierra Madre Volunteer Firefighter’s Association Annual Easter Egg Hunt will be held today, promptly at 10:00am. The Easter Egg Hunt will be held in Sierra Madre Memorial Park, located at the corner of W. Sierra Madre Blvd. and Hermosa Avenue in Sierra Madre. The hunt will be hosted by the Sierra Madre Volunteer Firefighter’s Association and sponsored by Nestle USA Inc.
Children 12 years of age and younger are invited to enjoy Easter candy and “hunt” for the 24 Golden Eggs which are redeemable for gift baskets. Memorial Park will be divided into sections for different age groups. 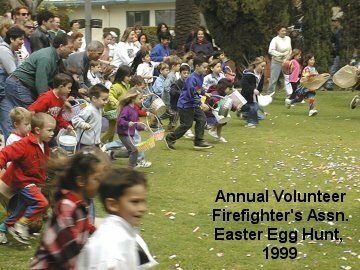 The Easter Egg Hunt has been an Annual Event in Sierra Madre since it was begun by the Firefighter’s Association in 1931. The Easter Bunny will arrive by Fire Engine just before 10:00am and will stay throughout the “hunt” and will be available for photographs during and after the festivities. Thousands of pieces of candy will be on the lawn in Memorial Park. Hope to see you there.